It'll be Ale 8 one. I just learned that The Six Million Dollar Man was almost titled “Cyborg,” referencing the book on which the show was based. Would I have watched it, with the original name? Probably; Steve Austin was super cute (I was about 7 years old), and I was enough of a general sci-fi/fantasy fan that using “cyborg” may not have deterred me. I likely would have learned the term earlier, had that happened. But, they chose The Six Million Dollar Man, and The Bionic Woman. Over the past few months, I’ve been shopping around for the next mobile phone I’ll buy. For a while I flirted with the idea of owning a very basic, non-smart phone, mainly to save money, but I now rely on being able to look up things like rice wine vinegar while pushing a cart around Dragon Star Foods or being able to upload a food-and-legos snapshot to Flickr. I also enjoy some of the other benefits of the smart phone, like mapping, gaming, reading headlines while killing time in a doctor’s office wating room. My iPhone 3G has become so sluggish that to a degree it has deterred me from getting another iPhone, even though just updating the model would likely solve the speed problems and also offer some other excellent enhancements. However, I’m finding that the adventurer, designer, and rebel in me really wants to get a phone with a different name, a phone that might be fun to learn to use, and a possibly less expensive phone, as well. Which is why I opened this post with bionics. The phones currently in the running have names like Razr, Galaxy, Droid, Vortex and/or Charge. The one that’s winning is called the Bionic. It looks to be a pretty solid, though not perfect, appliance. And it might bring my coolness (and strength?) just a bit closer to that of the most excellent Jaime Sommers. I’m a designer, a word fanatic and also someone who works in technology, so it’s no surprise to me how important the name of a product is to marketing that product. In fact, I’m currently facing that exact problem in another area: what the heck should I call my yoga business? 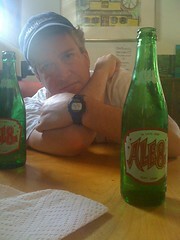 Related: I posted the above photo because Steve and I discovered Kentucky’s “Ale 8 One ” soda on a recent trip. We loved the gingery soda and its name. It sounds especially good, when requested in a Kentucky accent. Anyway, I found an interesting study done on mobile phone names, done 2 years ago. You can check it out here (you’ll need to download the PDF). Enjoy.